Behind two home runs and a clutch performance out of the bullpen, Texas closed out a trip to Texas Tech with a 7-5 win on Sunday. The triumph improved Texas’ record to 33-18, and the Longhorns are 14-7 in Big 12 play. UT’s win also kept Texas Tech (35-14; 12-9) and Oklahoma (31-18; 13-8) out of a second-place tie in the conference’s standings. Oklahoma State (28-17-1) leads the Big 12 with a 15-3 mark. Texas won two of its three games at Lubbock’s Dan Law Field this weekend. UT also rallied to an 11-10 win over Texas State on May 1. 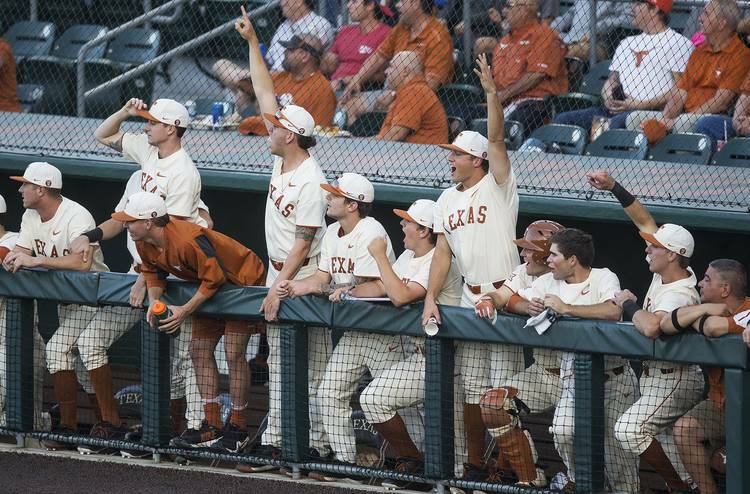 Texas was ranked 24th in the D1Baseball poll this week, while Texas Tech was slotted ninth. Thanks to RBIs from Zach Zubia and Tate Shaw and a run-scoring wild pitch, Texas scored three times in the first three innings on Sunday. The Longhorns, however, faced a 4-3 deficit as they entered the seventh frame. With one out, junior Kody Clemens tied the game with a solo homer. Three batters later, Zubia lifted UT to a lead with a two-run shot. The game-tying home run was the 16th of the year for Clemens, who homered twice in Friday’s 12-6 rout of Texas Tech. Only seven Longhorns have hit more home runs in a single season than Clemens. Kyle Russell’s 28 homers in 2007 is the school record. Those homers — plus an insurance run added on Jake McKenzie’s RBI single in the eighth inning — made a winner out of UT reliever Parker Joe Robinson. A junior, Robinson allowed one hit and an unearned run over 2 2/3 innings. Robinson also let only one Red Raider score when he relieved starter Blair Henley with the bases loaded and no outs in the sixth inning. Andy McGuire worked around two base runners in the ninth inning to earn his seventh save. Due to finals, Texas will not play this upcoming week. The Longhorns are set to return to UFCU Disch-Falk Field on May 15 for a contest against Texas State. Texas will then close out its regular season with three home games against TCU.